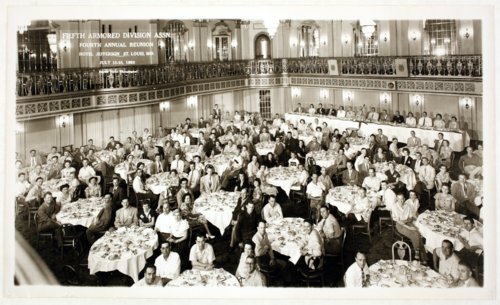 This is a panoramic photograph showing the fourth annual reunion of the Fifth Armored Division Association at the Hotel Jefferson in St. Louis, Missouri. The Fifth Armored Division was part of the United States Army and was active during World War II from 1941 to 1945. Herbert and Eva Michaelis from Russell, Kansas, are seated on the far right, third table from the bottom.